Can I bring the tone of the discussion down from the sublime to the geeky by mentioning how much this reminds me of Amidala's coffin in Episode III of Star Wars? There's a good picture - that you can click on to enlarge - further down this page to the left: http://starwars.wikia.com/wiki/Funeral_of_Padm%C3%A9_Amidala. To raise the tone again, however, it always reminded me of Millais' "Ophelia". 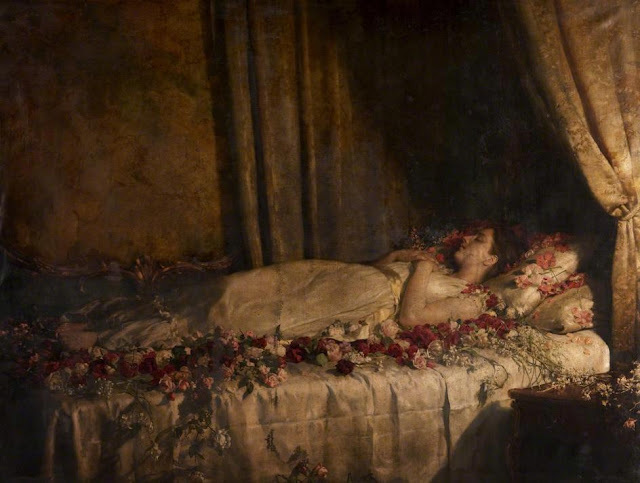 Someone mentioned the Ophelia influence at the conference I spoke at - and its interesting to think about the idea of drowning in scent/flowers and I am certain Collier would have had Millais' painting in mind. The comment also reinforced for me the thought that in my book I have to be sure to include more familiar reference points too. Thank you! Victorianlibrarian... an auction house colleague of mine tells me that George Lucas is a big art collector. So, it is even more likely that he would have had Millais's Ophelia in mind. Coming from German nineteenth-century literature, I have to wonder whether the flowers were in full bloom or just buds--as the state of the flower would correlate to the state of a young woman's sexuality: nascent or fully flowered. While thinking of flowers and deflowering and looking at the painting, I assume (not being familiar with this Zola work) that she was seduced, probably willingly, and then left and the symbols of her sexual awakening become the symbols of her death. That's an interesting point. In the text she has an innocent, very natural quality - but she is not a virgin - they consumate their relationship before he abandons her. In the painting there are some tight buds - but also flowers where the roses are past their zenith!